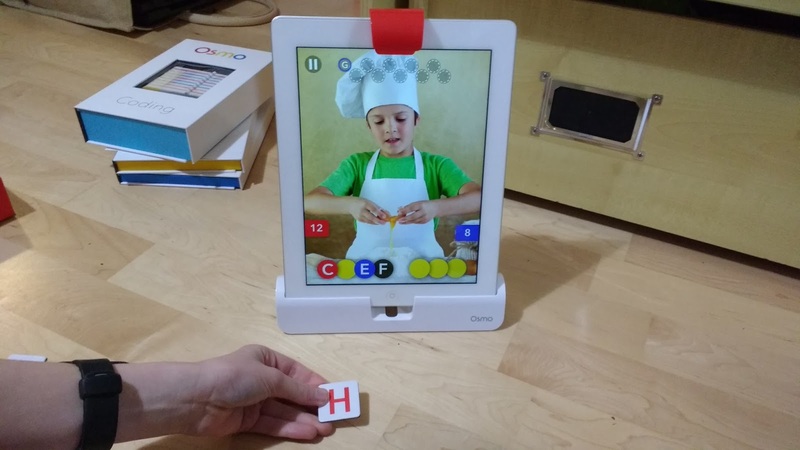 We've reviewed the Osmo educational gaming system for the iPad. 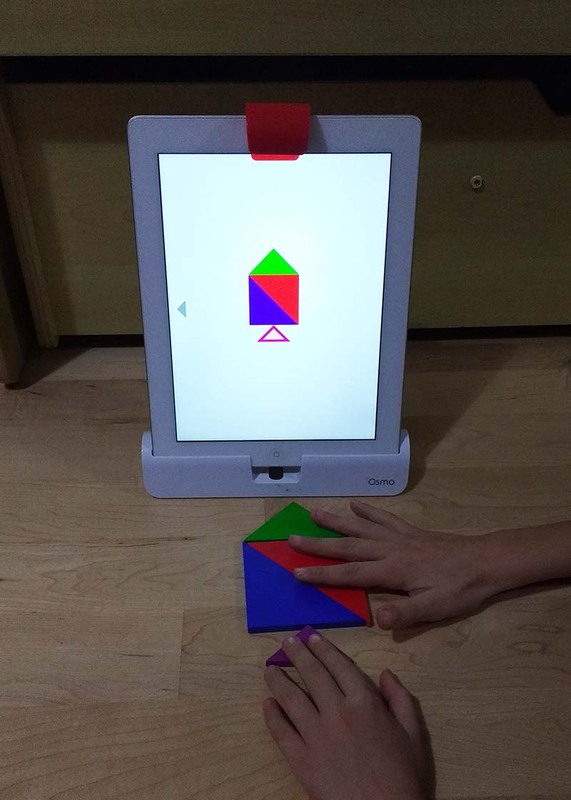 Osmo combines physical play with digital apps. 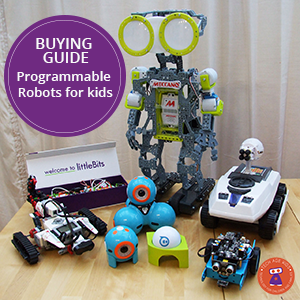 This approach means that kids get the benefits of physical and digital play. 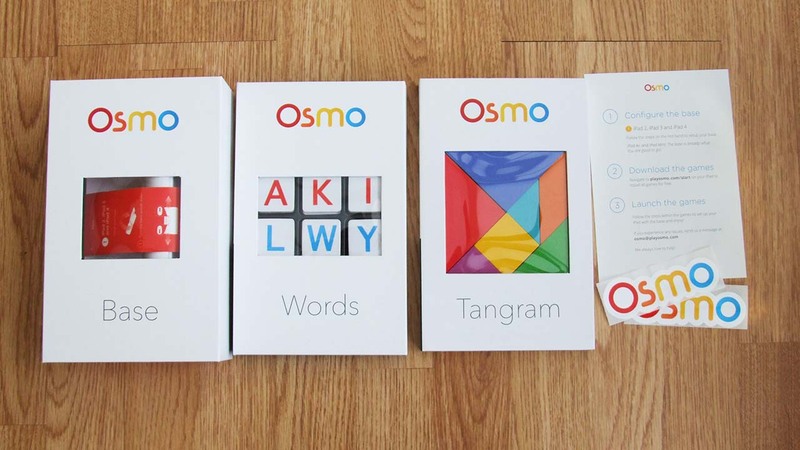 We're a little obsessed with packaging at Tech Age Kids and we have to say Osmo's packaging is among the best we've seen. The boxes not only snap shut magnetically, they also snap together into a satisfyingly neat stack. There's a choice of starter kits and they all include the stand which works with iPads of different sizes and the Osmo camera add-on. The camera is really easy to attach and remove and it's very quick to pop the tablet in the stand, this is important because it's really easy to just grab Osmo and get playing. The different games have different physical pieces. The Tangram set is wooden and very gorgeous. The pieces go back into their lovely magnetic boxes for storage. Very practical. Someone has thought about this. You'll need the Osmo apps. These actually work on iPads as old as the iPad 2 (Elbrie still has one of those so she appreciates this as she can keep hold of her new iPad Air 2!) The stand adjusts to accommodate different sizes of iPad which works really well. Each game has a different app so you'll need to install multiple apps. You do have to take the iPad out of the case. My kids iPads are in tough protective cases so they have been using my old iPad 3 which works just fine. You can use Osmo without creating a parent account, but if you do create an account then it guides you through which apps you can use with the sets you've got which is useful. You can also set up profiles if you have multiple children so that they can store progress separately. The Tangram game is utterly awesome. I love Tangrams and really enjoyed them as a child. But modern kids have a lot of alternatives to making Tangrams from bits of paper to recreate diagrams in books. Osmo completely updates the concept for modern kids. In the Tangrams game children must arrange coloured wooden Tangram pieces to match what they see on the screen. This is great for developing spatial awareness skills. My 8 year old found some of the puzzles challenging, and he enjoyed being challenged. There was an occasional frustration when his correct creation wasn't recognised, but moving the tangram or the stand usually fixed this pretty quickly. The graphics are lovely and my son was really engaged by the whole concept. The Words app uses a set of letter tiles. There are multiple ways to use it and it takes a while to get your head around it. We were expecting something that helps with phonics or spelling, but it's not really that. Versus: A competitive game where you have to guess a word from a picture. My two boys (8 and 10) played competitively. A picture appears and you have to be first to make the word it represents. One player uses the blue letters and the other uses the red letters. You get points for each letter that you contribute to the word rather. Sometimes the words are a real stretch to identify from the pictures so you need to guess letters. You also get clues if you're struggling. We found that this game is really hard to play with siblings of different ages as the older one is always going to be faster. Though my eight year old came up with the strategy of gathering the letters up and playing them all at once so that he didn't give his brother clues. I ended up helping my younger son to catch up when he got behind. As a competitive game it would work better in a school environment with children of similar abilities or with evenly matched teams of family and friends. We also came up with the idea of placing my older son's letters further away to make it harder for him! Zen: There's also a Zen version of the game where any number can play together collaboratively. You can work on your own or as a group to identify the words. Custom library: The Versus and Zen modes can be used with custom libraries. Lots of these have been created by the Osmo community. You can create your own library or words and pictures which really extends what you can do with the Osmo app. This is where Words really comes into its own educationally either in the classroom or at home. Kids can learn the names of countries, musical terms, vocab from the water cycles and lots more. We'd suggest that if you're giving Osmo as a gift you play with the Words app first and set it up with libraries that suit your children. This gives a much smoother experience. Of course we were really interested in Osmo Coding. This is an extra add-on pack. 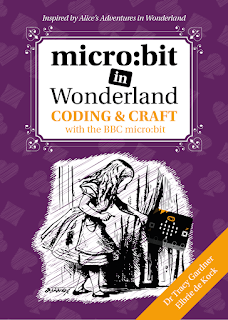 This one is recommended from age 5 but some kids would find it accessible at a younger age. The concept is lovely. 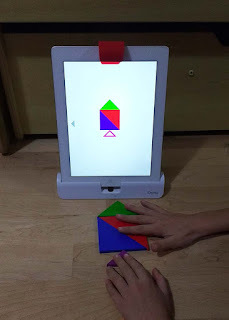 Kids combine physical blocks to make code and navigate an onscreen character called Awbie. You can add numbers to repeat a command and a really nice touch is being able to move the arrow to set the direction of the move blocks. My 8 year old really liked the physical play button to run the code. My 10 year old loves how everything snaps together satisfyingly with magnets. 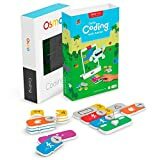 Osmo Coding is a lovely gentle introduction to coding. It has relaxing music and lovely graphics. But kids will have to think to make progress. As kids make their way through the levels they meet cute animals and collect items to help them build their base which is really motivating. The levels gradually get harder, but the nature of the game play means that it naturally adjusts to children's ability because more able children can use more commands in one go or come up with more efficient solutions. I've got a confession to make. 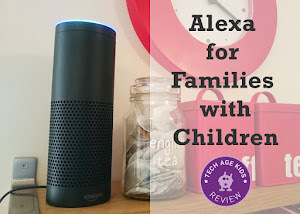 I thought I should play ahead of my 8 year old a bit to get to the more advanced features to do a thorough review and see how it all works and I ended up playing for ages. I've got a computer science PhD ... Osmo Coding is strangely compelling! There's also a Numbers apps which requires the Numbers set which is included in the Genius starter set or available to purchase separately. My kids are pretty able mathematically so this wasn't a priority for us but would have been when they were younger. 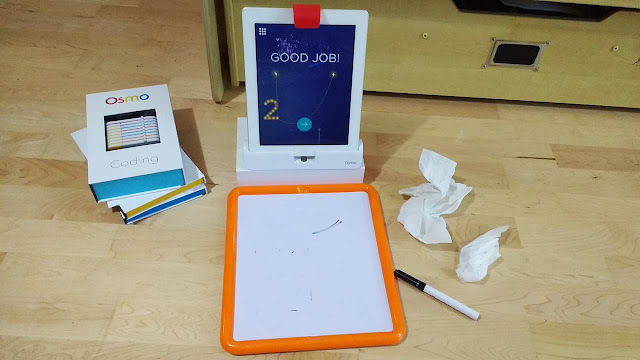 The Monster kit for younger kids includes a wipe clean drawing board and accessories and the app content is targeted for age 4+. The Masterpiece drawing app allows kids to trace pictures including photos they have taken which is a neat idea. You see your hand and pen onscreen so you can follow what you see. The new Pizza game also looks like a lot of fun. It's a game where kids run a Pizza business using physical pieces and the corresponding Osmo app. The age recommendation on Amazon given as 6+ which doesn't really make sense in the UK. My younger son was only just 4 when he started school and was reading well by 5. 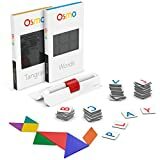 In the UK you would want to buy Osmo for a four year old to get the most from it. Osmo recommend their apps from age 5-12 except for Monster which is 4-9. We'd definitely recommend starting Osmo at age 4 or even 3. There is content for older children but you'll get the most value by starting earlier. Osmo is fab. 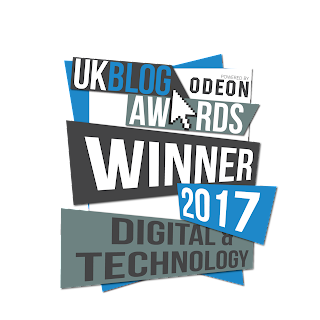 We think lots of parents will appreciate the way it encourages physical activities while tapping into kids love of all things digital. Encouraging hands-on physical play is one of the things I'm really encouraging with my kids at the moment. The set is really well designed and thought through. It's a toy that I like seeing rather than being annoyed by! The camera approach works well and we had very few situations where something wasn't recognised. This means that play is frustration free. We really like that Osmo even works on older devices. It's a great way to get use out of an old iPad that won't run the latest apps. Our big recommendation is that you really don't want to wait until your child is 6 to get Osmo. The Monster game pack is recommended from age 4+ and it's easy to miss that if you focus on the prominent 6+ age recommendation on the starter packs. Older kids will enjoy it too, but you might kick yourself if you wait. Also be aware that you're going to need to take the iPad out of its case to use Osmo so if you have a case that's difficult to remove you might want to consider swapping it. 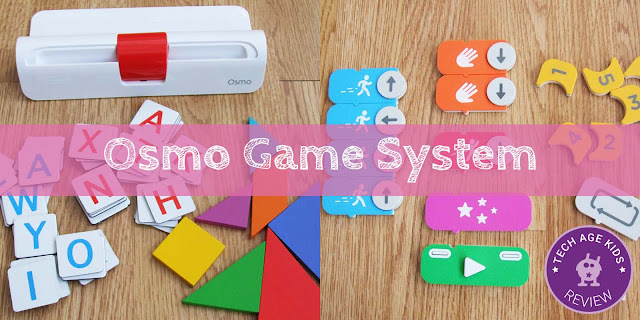 We'd recommend getting Osmo out of the box and setting it up before giving it to a younger child. It's boring having to wait for apps to download and a parent to set up an account and profile and figure out how the Words app works. 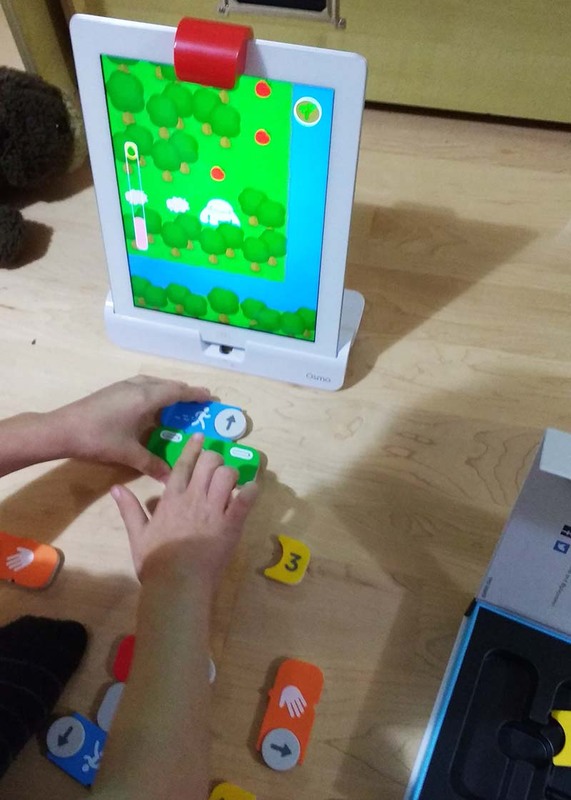 Osmo is fantastic for families that are worried that kids aren't spending enough time developing their fine motor skills or where kids device time is too passive.